Excerpt from a report by the Imperial Scouting Corp, 33 A.R. This adventure school has undergone a sizable overhaul including the replacement of abilities and a change in the school's purpose. The school is now focused on being a "Tank" that draws the attention of monsters to itself and attempts to hold it, protecting other party members in the process. It does this through a series of new abilities and summoned items including reactive shield abilities such as Shield Slam and taunts such as Brandish and Battle Shout. A series of quests are also available from Honored Demonte Seviris in Dalimond. - The Fall Festival grounds have received some decorational upgrades. - Spawns in the Fall Festival Haunting Ground have been revamped to be less linked and more diverse. - Several truly terrifying creatures have been spotted in the deepest reaches. - All fall festival masks, as well as the fall festival shirt, can now be used to create a tech kit to put on your fighting gear, though this requires some candy each time! Stacks with all types of armor. - A new dragon head scale and biped mask - Regal Head Scale and Regal Mask - are now available for purchase from Jacques. 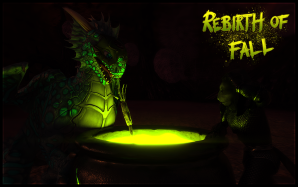 - New Dragon masks and one new Biped mask are available for purchase from Jacques as well as per the results of the fall festival contest! - New stories have been added to the world as per the results of the fall festival contest! - New murals have been added to lairs as per the results of the fall festival contest! - A new banner has been added to plots as per the results of the fall festival contest! - Spider Head Scale, Madame Butterfly Head Scale, Triclopse Head Scale, and Nyrevin's Apology Head Scale now all have custom icons corresponding to their actual look. - Fall Harvest Mask now has its own custom icon. - A Dead Spider can once again be looted from fall festival creatures. - Fixed typo in Cursed Misty Health Potion effect. - Platemail Chestguards that have Armor Tech Kit: Champion applied, will properly show the graphics from the tech kit. - Rift Spirit Form now adds +15 to speed while equipped to compensate for loss of gliding in the Rift. - Smashed debuff no longer has a level requirement. - Illustrious Stand now boosts the incoming healing amounts on players by 10%. It also applies a percentage penalty to the monster's to-hit instead of a flat value. - Dragon's Primal Rebirth post delay has been reduced. - Master Antidote no longer requires different resources from the other tiers of Antidote formulas to create the same potions. - Formula: Adult Dragon Statue will properly engage with Stoneworking Pedestal instead of Stone Cutter machine. - A new item called "Armor Cleaning Kit" - sold by Geoff - has been added as a way to remove graphical effects from things such the Champion or Hours of Frost 2017 tech kits on head scales, masks, etc. - Formula: Purified Essence Powder once again uses Intuition skill for the resource. It was inadvertently changed to Alchemy skill in June. - Surtheim Fragment Ally's Aura of Flame effect will no longer dispell from mob when Breath of Lightning is cast. - Werewolves in the Dusk Forest can transmit a weak lycanthropy on bite. - Quest items related to the Dusk Forest now properly stack. - Speaking to Fillet while on quest: Mementos for Fillet would not progress quest. - Quest "Earn Title: Expert Crystalshaper" now checks if you have completed the quest, not if you have the title or not. - Town Marshall: Dancing Through the Fire quest will now also count Zal'kuk Adept that are killed. - Anarie the Loyalty Vendor will now be offering small quests for cosmetic titles to players with 100, 365, 500, 1000, 2000, 3000, 4000, and 5000 days since creation. - T1 - T5 Dragon Crafting Mastery Quests (that collect resources) now award a small amount of experience (instead of no experience). Previously only Crafting Mastery quests that you crafted an item would award experience. - Valkoth the Ancient now offers attunement quests to Pyrakis and Nu'delak to all dragons. - All capes now properly tint to the material they are constructed from. - Updated mobile resource node gather distances. - Typos fixed in the Hours of Frost tech kit descriptions. - The Hours of Frost dragon scale and biped masks have had a facelift done to their icons as well as their respective tech kits. - Resized Drakul lairs: Ar'akis, Chirdelak, Incignat, Sylrak, Myrkjira, Pyrakis, Liakis, Soklifak, Aklet. - Arena Gatekeeper is now known as Akalivar and has a regular appearance and clothing. Master Akalivar now offers attunement to the Isles of Battle through a quest instead of his regular dialog. - The Imperial Commission on Gambling has authorized the re-introduction of the Large Gambling Den for construction on player lands. The new structure is greatly improved with enhanced furnishings and as a result is significantly more costly to construct; it requires Tier 6 resources as well as the purchase of a Gambling Permit from the Empire. - Ssaulios no longer sells Tavern Hiring Permit; Pawnbrokers continue to sell this permit in addition to a new Gambling Permit for 1g. - T1 Community Lair at NW corner of Lesser Aradoth Deadlands 198/232 now has Storage Tier 1 Community Shop storage (2 slots/80,000 bulk). Great for nearby Viridian Azulyte and Dim Wisps. - South Gate and Harton Valley have been decorated. - Demonte Seviris is now known as Most Honored and has updated dialog. - Galean Adair the KnoC Trainer is now known as Honored Galean Adair and has updated dialog. He has relocated to Aughundell. - Gnome, dwarf, and half-giant males now have sleeping animations as well as khutit dragons and both genders of dryads. - Dragons will now play a unique animation when taking off from a run. - The dragon sleep animation has been given slight adjustments to feel more natural. - Noncas' Bi-Directional Scanner's icon no longer looks unfinished. - Fix for when an ability caps the fly height, permanently clips wings. - Hours of Frost scale and mask technique kits no longer appear as a question mark. - Akkinelos cultist robe should now display a texture. - Hatchlings no longer make the happy dance emote sound effect while dying. - The take-off from run animation has had some slight adjustments to speed and transitioning. - The movement (primarily running) animations of elves, fiends, half-giants, humans, khutit, saris, satyr, and sslik have been adjusted to be a more appropriate speed compared to real movement speed. - Fafnir no longer plays Boss music. Gruk now plays Boss Music.